Children learn to use irregular verbs naturally as they speak and write English, but will also understand more about them during their time at primary school. We explain how irregular verbs are introduced in the classroom in our guide for parents. A verb is a doing or being word (for example: sit, talk, eat, think, feel). A verb tense tells us when the action or state described by the verb happened. 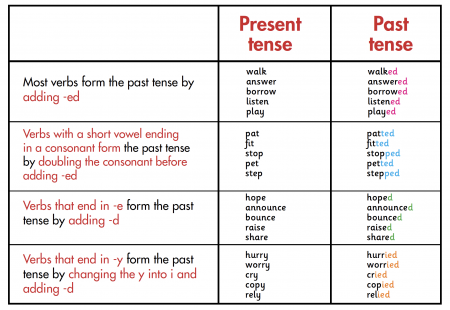 The three main verb tenses in English are the present, the past, and the future. How do irregular verbs work? Some verbs are irregular and do not follow this pattern but form their past tense in a particular way (by changing a vowel, for example); sometimes their past participle is the same as the past tense (as it is in regular verbs), but sometimes it differs. 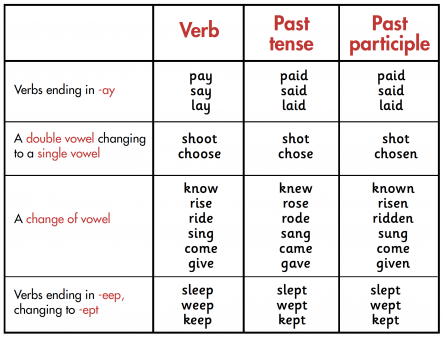 The past participles in blue below are ones that differ from the past tense of the verb. When do children learn about irregular verbs in primary school? In Year 1, children will learn how to add the suffix -ed to a regular verb to put it into the past tense (for example: hunt - hunted, jump - jumped, etc.). In Year 2, children will learn about verbs that have a short vowel and a consonant (for example, pop). When these verbs are put in the past tense, the last consonant needs to be doubled before -ed is added (popped). Though there is nothing in the national curriculum to say that irregular verbs should be explicitly taught at primary school, most of us learn them simply by speaking and writing the English language every day. The correct use of irregular verb forms is part of Standard English and it is something that is likely to be picked up on for individual children through a teacher's marking.